Hair loss happens to millions of women and men all over the world. Normally, our hair grows in a cycle. When hairs are in their growth phase, they are called anagen hairs. When they are resting (not growing), they are called telogen hairs. Catagen hairs are transitioning from growth to rest. Anagen hairs grow for about 3 years on average (the range can be between 2-6 years). The transition phase lasts about 1-2 weeks, and then hairs rest for 3-5 months. They shed, and the cycle starts all over again. At any given time, if you pluck a number of hairs from the scalp, about 85% will be in the growth phase and 10-15% will be resting. Less than 1% will be in the transition phase. It's normal to shed 100-150 hairs daily. But sometimes, that number increases, and the hair starts thinning or revealing bald patches. Here are some reasons why people lose their hair. Pregnancy. During pregnancy, the anagen (growth) phase is often prolonged and many women enjoy thicker, fuller hair. 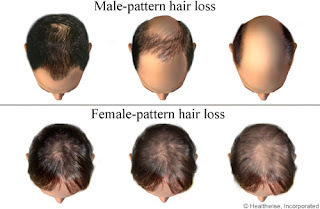 On delivery of the baby, however, many follicles change into the telogen phase, and then are shed simultaneously; resulting in thinning/loss of hair 3-5 months after baby comes. This process is known as telogen effluvium. Iron Deficiency. Low iron levels (seen in a blood test), sometimes caused by menstruation or gastrointestinal blood loss, can also cause a telogen effluvium. Nutritional deficiencies are often treated with vitamin supplements and a varied, healthy diet. Thyroid Deficiency. Variations in thyroid levels can often cause telogen effluvium as well. Levels can be checked with a simple blood test. Thyroid medications, usually monitored by an endocrinologist can help. Medications. Lots of medications can cause hair loss. Drug-induced telogen effluvium has been reported with amphetamines, blood pressure medications, antipsychotics (lithium), retinoid and more. Changing/discontinuing medications can help. Other conditions that can lead to hair loss include fungal infections, autoimmune diseases (such as lupus or alopecia areata), psoriasis, bacterial infections, and syphilis. Trauma to the hair from tight ponytails, frequent relaxer and hair colour use, and over styling can also lead to hair loss. Often blood tests and scalp biopsies are useful to find the cause of the hair loss. Book an appointment with a Dermatologist who specialises in this area. !